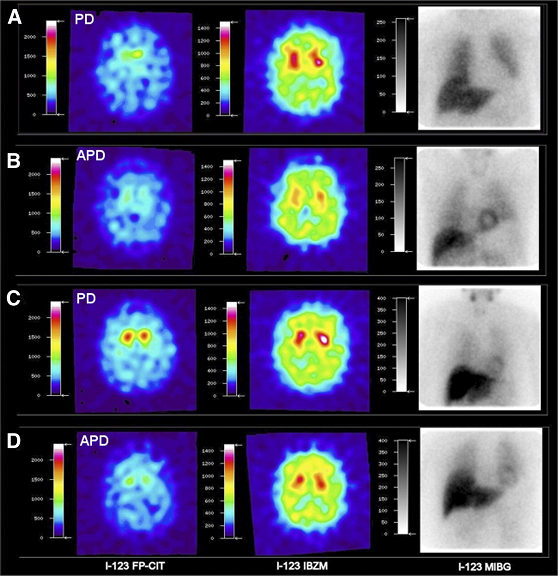 FP-CIT SPECT, IBZM SPECT, and cardiac MIBG scans for Parkinson's Disease (A and C) and Atypical Parkinsonian Disorder (B and D). The average patient age was 65 years old. Because multiple neurological disorders mimic Parkinson’s disease and there can be overlaps in multiple conditions, it can be difficult to diagnose. SPECT scanning with the FDA approved radiotracer I-123-ioflupane injection (also called DaTscan) may allow for earlier and more accurate diagnosis of Parkinson’s disease. A scan using DaTscan is able to detect dopamine transporters (DaTs). The distribution of DaTs is abnormal in patients with Parkinsonian syndromes but normal in patients with other conditions, such as essential tremor and Alzheimer’s disease.